A join combines the output from exactly two row sources, such as tables or views, and returns one row source. The returned row source is the data set. A join is characterized by multiple tables in the WHERE (non-ANSI) or FROM ... JOIN (ANSI) clause of a SQL statement. Whenever multiple tables exist in the FROM clause, Oracle Database performs a join. As shown in the following graphic, table1 is the left table, and table2 is the right table. The optimizer processes the join from left to right. For example, if this graphic depicted a nested loops join, then table1 is the outer loop, and table2 is the inner loop. Description of "Figure 9-1 Join Tree"
The input of a join can be the result set from a previous join. If the right child of every internal node of a join tree is a table, then the tree is a left deep join tree, as shown in the following example. Most join trees are left deep joins. Description of "Figure 9-2 Left Deep Join Tree"
If the left child of every internal node of a join tree is a table, then the tree is called a right deep join tree, as shown in the following diagram. Description of "Figure 9-3 Right Deep Join Tree"
If the left or the right child of an internal node of a join tree can be a join node, then the tree is called a bushy join tree. In the following example, table4 is a right child of a join node, table1 is the left child of a join node, and table2 is the left child of a join node. Description of "Figure 9-4 Bushy Join Tree"
In yet another variation, both inputs of a join are the results of a previous join. The database joins pairs of row sources. When multiple tables exist in the FROM clause, the optimizer must determine which join operation is most efficient for each pair. As for simple statements, the optimizer must choose an access path to retrieve data from each table in the join statement. For example, the optimizer might choose between a full table scan or an index scan. See "Optimizer Access Paths". To join each pair of row sources, Oracle Database must decide how to do it. The "how" is the join method. The possible join methods are nested loop, sort merge, and hash joins. A Cartesian join requires one of the preceding join methods. Each join method has specific situations in which it is more suitable than the others. See "Join Methods". The join condition determines the join type. For example, an inner join retrieves only rows that match the join condition. An outer join retrieves rows that do not match the join condition. See "Join Types". To execute a statement that joins more than two tables, Oracle Database joins two tables and then joins the resulting row source to the next table. This process continues until all tables are joined into the result. 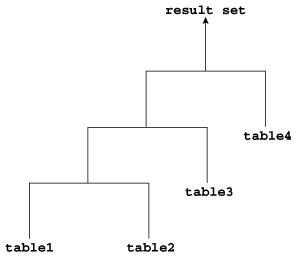 For example, the database joins two tables, and then joins the result to a third table, and then joins this result to a fourth table, and so on. When determining the join order and method, the optimizer goal is to reduce the number of rows early so it performs less work throughout the execution of the SQL statement. The optimizer first determines whether joining two or more tables results in a row source containing at most one row. The optimizer recognizes such situations based on UNIQUE and PRIMARY KEY constraints on the tables. If such a situation exists, then the optimizer places these tables first in the join order. The optimizer then optimizes the join of the remaining set of tables. For join statements with outer join conditions, the table with the outer join operator typically comes after the other table in the condition in the join order. In general, the optimizer does not consider join orders that violate this guideline, although the optimizer overrides this ordering condition in certain circumstances. Similarly, when a subquery has been converted into an antijoin or semijoin, the tables from the subquery must come after those tables in the outer query block to which they were connected or correlated. However, hash antijoins and semijoins are able to override this ordering condition in certain circumstances. The optimizer estimates cost of a query plan by computing the estimated I/Os and CPU. These I/Os have specific costs associated with them: one cost for a single block I/O, and another cost for multiblock I/Os. Also, different functions and expressions have CPU costs associated with them. The optimizer determines the total cost of a query plan using these metrics. These metrics may be influenced by many initialization parameter and session settings at compile time, such as the DB_FILE_MULTI_BLOCK_READ_COUNT setting, system statistics, and so on. The cost of a nested loops join depends on the cost of reading each selected row of the outer table and each of its matching rows of the inner table into memory. The optimizer estimates these costs using statistics in the data dictionary. The cost of a sort merge join depends largely on the cost of reading all the sources into memory and sorting them. The cost of a hash join largely depends on the cost of building a hash table on one of the input sides to the join and using the rows from the other side of the join to probe it. Conceptually, the optimizer constructs matrix of join orders and methods and the cost associated with each. For example, the optimizer must determine how best to join the date_dim and lineorder tables in a query. The following table shows the possible variations of methods and orders, and the cost for each. In this example, a nested loops join in the order date_dim, lineorder has the lowest cost. As shown in Figure 9-5, each join method has two children: the driving (also called outer) row source and the driven-to (also called inner) row source. Description of "Figure 9-5 Join Method"
Nested loops join an outer data set to an inner data set. For each row in the outer data set that matches the single-table predicates, the database retrieves all rows in the inner data set that satisfy the join predicate. If an index is available, then the database can use it to access the inner data set by rowid. Nested loops joins are useful when the database joins small subsets of data, the database joins large sets of data with the optimizer mode set to FIRST_ROWS, or the join condition is an efficient method of accessing the inner table. The number of rows expected from the join is what drives the optimizer decision, not the size of the underlying tables. For example, a query might join two tables of a billion rows each, but because of the filters the optimizer expects data sets of 5 rows each. In general, nested loops joins work best on small tables with indexes on the join conditions. If a row source has only one row, as with an equality lookup on a primary key value (for example, WHERE employee_id=101), then the join is a simple lookup. The optimizer always tries to put the smallest row source first, making it the driving table. Various factors enter into the optimizer decision to use nested loops. For example, the database may read several rows from the outer row source in a batch. Based on the number of rows retrieved, the optimizer may choose either a nested loop or a hash join to the inner row source. For example, if a query joins departments to driving table employees, and if the predicate specifies a value in employees.last_name, then the database might read enough entries in the index on last_name to determine whether an internal threshold is passed. If the threshold is not passed, then the optimizer picks a nested loop join to departments, and if the threshold is passed, then the database performs a hash join, which means reading the rest of employees, hashing it into memory, and then joining to departments. If the access path for the inner loop is not dependent on the outer loop, then the result can be a Cartesian product: for every iteration of the outer loop, the inner loop produces the same set of rows. To avoid this problem, use other join methods to join two independent row sources. Conceptually, nested loops are equivalent to two nested for loops. The inner loop is executed for every row of the outer loop. The employees table is the "outer" data set because it is in the exterior for loop. The outer table is sometimes called a driving table. The departments table is the "inner" data set because it is in the interior for loop. The optimizer determines the driving row source and designates it as the outer loop. The outer loop produces a set of rows for driving the join condition. The row source can be a table accessed using an index scan, a full table scan, or any other operation that generates rows. The number of iterations of the inner loop depends on the number of rows retrieved in the outer loop. For example, if 10 rows are retrieved from the outer table, then the database must perform 10 lookups in the inner table. If 10,000,000 rows are retrieved from the outer table, then the database must perform 10,000,000 lookups in the inner table. The optimizer designates the other row source as the inner loop. Sometimes the database sorts rowids to obtain a more efficient buffer access pattern. The outer loop of a nested loop can itself be a row source generated by a different nested loop. The database can nest two or more outer loops to join as many tables as needed. Each loop is a data access method. The output of NESTED LOOP 1 is a row source. The output of NESTED LOOPS 2 is another row source. The database searches the emp_name_ix for the rowids for all last names that begins with A (Step 4). These rows become the outer row source for the innermost nested loop. The batch step is typically part of adaptive execution plans. To determine whether a nested loop is better than a hash join, the optimizer needs to determine many rows come back from the row source. If too many rows are returned, then the optimizer switches to a different join method. These rows become the outer row source for the outer nested loop (Step 1). The database reads the first row in outer row source. The database uses the departments rowid to retrieve the corresponding row from departments (Step 6), and then joins the result to obtain the requested values (Step 1). The database reads the next row in the outer row source, uses the departments rowid to retrieve the corresponding row from departments (Step 6), and iterates through the loop until all rows are retrieved. Oracle Database 11g introduced a new implementation for nested loops that reduces overall latency for physical I/O. When an index or a table block is not in the buffer cache and is needed to process the join, a physical I/O is required. The database can batch multiple physical I/O requests and process them using a vector I/O (array) instead of one at a time. The database sends an array of rowids to the operating system, which performs the read. As part of the new implementation, two NESTED LOOPS join row sources might appear in the execution plan where only one would have appeared in prior releases. In such cases, Oracle Database allocates one NESTED LOOPS join row source to join the values from the table on the outer side of the join with the index on the inner side. A second row source is allocated to join the result of the first join, which includes the rowids stored in the index, with the table on the inner side of the join. In this case, rows from the hr.departments table form the outer row source (Step 3) of the inner nested loop (Step 2). The index emp_department_ix is the inner row source (Step 4) of the inner nested loop. The results of the inner nested loop form the outer row source (Row 2) of the outer nested loop (Row 1). The hr.employees table is the outer row source (Row 5) of the outer nested loop. This row set is the outer loop. The database caches the data in the PGA. The database scans emp_department_ix, which is an index on the employees table, to find employees rowids that correspond to this department ID (Step 4), and then joins the result (Step 2). The database reads the next row of departments, scans emp_department_ix to find employees rowids that correspond to this department ID, and then iterates through the loop until the client request is satisfied. These rows become the outer row source for the outer nested loop (Step 1). This row set is cached in the PGA. The database organizes the rowids obtained in the previous step so that it can more efficiently access them in the cache. The database retrieves the next row from the row set, uses the rowid to probe employees for the matching row, and iterates through the loop until all rows are retrieved. The order of the rows returned might be different from the order returned in releases earlier than Oracle Database 12c. Thus, when Oracle Database tries to preserve a specific ordering of the rows, for example to eliminate the need for an ORDER BY sort, Oracle Database might use the original implementation for nested loops joins. The OPTIMIZER_FEATURES_ENABLE initialization parameter is set to a release before Oracle Database 11g. In this case, Oracle Database uses the original implementation for nested loops joins. In the current release, both the new and original implementation of nested loops are possible. This row set is the outer loop. The database caches the row in the PGA. The database scans emp_department_ix, which is an index on the employees.department_id column, to find employees rowids that correspond to this department ID (Step 4), and then joins the result (Step 2). The database reads the next row of departments, scans emp_department_ix to find employees rowids that correspond to this department ID, and iterates through the loop until the client request is satisfied. Depending on the circumstances, the database may organize the cached rowids obtained in the previous step so that it can more efficiently access them. For each employees rowid in the result set generated by the nested loop, the database retrieves a row from employees to obtain the requested values (Step 1). For some SQL examples, the data is small enough for the optimizer to prefer full table scans and hash joins. However, you can add a USE_NL to instruct the optimizer to join each specified table to another row source with a nested loops join, using the specified table as the inner table. The related hint USE_NL_WITH_INDEX(table index) hint instructs the optimizer to join the specified table to another row source with a nested loops join using the specified table as the inner table. The index is optional. If no index is specified, then the nested loops join uses an index with at least one join predicate as the index key. The database retrieves the next row in employees, retrieves the matching row from departments, and then repeats this process until all rows are retrieved. The database uses a hash join to join larger data sets. The optimizer uses the smaller of two data sets to build a hash table on the join key in memory, using a deterministic hash function to specify the location in the hash table in which to store each row. The database then scans the larger data set, probing the hash table to find the rows that meet the join condition. In general, the optimizer considers a hash join when a relatively large amount of data must be joined (or a large percentage of a small table must be joined), and the join is an equijoin. A hash join is most cost effective when the smaller data set fits in memory. In this case, the cost is limited to a single read pass over the two data sets. Because the hash table is in the PGA, Oracle Database can access rows without latching them. This technique reduces logical I/O by avoiding the necessity of repeatedly latching and reading blocks in the database buffer cache. If the data sets do not fit in memory, then the database partitions the row sources, and the join proceeds partition by partition. This can use a lot of sort area memory, and I/O to the temporary tablespace. This method can still be the most cost effective, especially when the database uses parallel query servers. A hashing algorithm takes a set of inputs and applies a deterministic hash function to generate a hash value between 1 and n, where n is the size of the hash table. In a hash join, the input values are the join keys. The output values are indexes (slots) in an array, which is the hash table. To illustrate a hash table, assume that the database hashes hr.departments in a join of departments and employees. The join key column is department_id. The optimizer uses the smaller data source to build a hash table on the join key in memory, and then scans the larger table to find the joined rows. The database performs a full scan of the smaller data set, called the build table, and then applies a hash function to the join key in each row to build a hash table in the PGA. The database probes the second data set, called the probe table, using whichever access mechanism has the lowest cost. Applies the same hash function to the join column or columns to calculate the number of the relevant slot in the hash table. For example, to probe the hash table for department ID 30, the database applies the hash function to 30, which generates the hash value 4. Probes the hash table to determine whether rows exists in the slot. If no rows exist, then the database processes the next row in the larger data set. If rows exist, then the database proceeds to the next step. Checks the join column or columns for a match. If a match occurs, then the database either reports the rows or passes them to the next step in the plan, and then processes the next row in the larger data set. If multiple rows exist in the hash table slot, the database walks through the linked list of rows, checking each one. For example, if department 30 hashes to slot 4, then the database checks each row until it finds 30. An application queries the oe.orders and oe.order_items tables, joining on the order_id column. Because the orders table is small relative to the order_items table, which is 6 times larger, the database hashes orders. In a hash join, the data set for the build table always appears first in the list of operations (Step 2). In Step 3, the database performs a full scan of the larger order_items later, probing the hash table for each row. 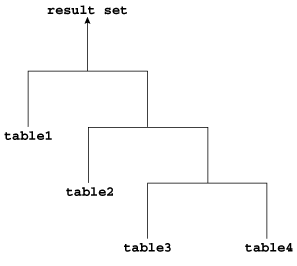 The database must use a different technique when the hash table does not fit entirely in the PGA. In this case, the database uses a temporary space to hold portions (called partitions) of the hash table, and sometimes portions of the larger table that probes the hash table. The database performs a full scan of the smaller data set, and then builds an array of hash buckets in both the PGA and on disk. When the PGA hash area fills up, the database finds the largest partition within the hash table and writes it to temporary space on disk. The database stores any new row that belongs to this on-disk partition on disk, and all other rows in the PGA. Thus, part of the hash table is in memory and part of it on disk. The database takes a first pass at reading the other data set. Applies the same hash function to the join column or columns to calculate the number of the relevant hash bucket. Probes the hash table to determine whether rows exist in the bucket in memory. If the hashed value points to a row in memory, then the database completes the join and returns the row. If the value points to a hash partition on disk, however, then the database stores this row in the temporary tablespace, using the same partitioning scheme used for the original data set. The database joins each partition row to the row in the corresponding on-disk temporary partition. The USE_HASH hint instructs the optimizer to use a hash join when joining two tables together. "Guidelines for Join Order Hints"
A sort merge join is a variation on a nested loops join. If the two data sets in the join are not already sorted, then the database sorts them. These are the SORT JOIN operations. For each row in the first data set, the database probes the second data set for matching rows and joins them, basing its start position on the match made in the previous iteration. This is the MERGE JOIN operation. 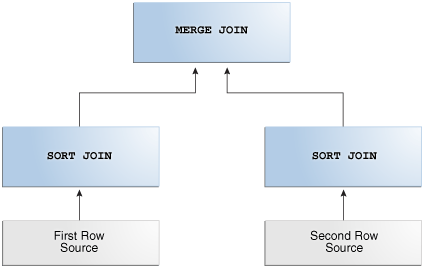 Description of "Figure 9-6 Sort Merge Join"
A hash join requires one hash table and one probe of this table, whereas a sort merge join requires two sorts. The join condition between two tables is not an equijoin, that is, uses an inequality condition such as <, <=, >, or >=. In contrast to sort merges, hash joins require an equality condition. Because of sorts required by other operations, the optimizer finds it cheaper to use a sort merge. If an index exists, then the database can avoid sorting the first data set. However, the database always sorts the second data set, regardless of indexes. After the initial sort, the merge phase is optimized, resulting in faster generation of output rows. A sort merge can be more cost-effective than a hash join when the hash table does not fit completely in memory. A hash join with insufficient memory requires both the hash table and the other data set to be copied to disk. In this case, the database may have to read from disk multiple times. In a sort merge, if memory cannot hold the two data sets, then the database writes them both to disk, but reads each data set no more than once. As in a nested loops join, a sort merge join reads two data sets, but sorts them when they are not already sorted. For each row in the first data set, the database finds a starting row in the second data set, and then reads the second data set until it finds a nonmatching row. For example, the following table shows sorted values in two data sets: temp_ds1 and temp_ds2. As shown in the following table, the database begins by reading 10 in temp_ds1, and then reads the first value in temp_ds2. Because 20 in temp_ds2 is higher than 10 in temp_ds1, the database stops reading temp_ds2. 10 [start here] 20 [start here] [stop here] 20 in temp_ds2 is higher than 10 in temp_ds1. Stop. Start again with next row in temp_ds1. The database proceeds to the next value in temp_ds1, which is 20. The database proceeds through temp_ds2 as shown in the following table. 10 20 [start here] Match. Proceed to next value in temp_ds2. 20 [start here] 20 Match. Proceed to next value in temp_ds2. 30 40 [stop here] 40 in temp_ds2 is higher than 20 in temp_ds1. Stop. Start again with next row in temp_ds1. The database proceeds to the next row in temp_ds1, which is 30. The database starts at the number of its last match, which was 20, and then proceeds through temp_ds2 looking for a match, as shown in the following table. 20 20 [start at last match] 20 in temp_ds2 is lower than 30 in temp_ds1. Proceed to next value in temp_ds2. 30 [start here] 40 [stop here] 40 in temp_ds2 is higher than 30 in temp_ds1. Stop. Start again with next row in temp_ds1. The database proceeds to the next row in temp_ds1, which is 40. As shown in the following table, the database starts at the number of its last match in temp_ds2, which was 20, and then proceeds through temp_ds2 looking for a match. 20 20 [start at last match] 20 in temp_ds2 is lower than 40 in temp_ds1. Proceed to next value in temp_ds2. 30 40 Match. Proceed to next value in temp_ds2. 40 [start here] 40 Match. Proceed to next value in temp_ds2. 50 40 Match. Proceed to next value in temp_ds2. 60 40 Match. Proceed to next value in temp_ds2. 70 40 Match. Proceed to next value in temp_ds2.
. 60 [stop here] 60 in temp_ds2 is higher than 40 in temp_ds1. Stop. Start again with next row in temp_ds1. The database continues in this way until it has matched the final 70 in temp_ds2. This scenario demonstrates that the database, as it reads through temp_ds1, does not need to read every row in temp_ds2. This is an advantage over a nested loops join. The two data sets are the departments table and the employees table. Because an index orders the departments table by department_id, the database can read this index and avoid a sort (Step 3). The database only needs to sort the employees table (Step 4), which is the most CPU-intensive operation. Because the departments.department_id index is ignored, the optimizer performs a sort, which increases the combined cost of Step 2 and Step 3 by 67% (from 3 to 5). The USE_MERGE hint instructs the optimizer to use a sort merge join. In some situations it may make sense to override the optimizer with the USE_MERGE hint. For example, the optimizer can choose a full scan on a table and avoid a sort operation in a query. However, there is an increased cost because a large table is accessed through an index and single block reads, as opposed to faster access through a full table scan. The database uses a Cartesian join when one or more of the tables does not have any join conditions to any other tables in the statement. In some cases, the optimizer could pick up a common filter condition between the two tables as a possible join condition. If a Cartesian join appears in a query plan, it could be caused by an inadvertently omitted join condition. In general, if a query joins n tables, then n-1 join conditions are required to avoid a Cartesian join. A Cartesian join is an efficient method. For example, the optimizer may decide to generate a Cartesian product of two very small tables that are both joined to the same large table. The ORDERED hint specifies a table before its join table is specified. In Step 1 of the preceding plan, the CARTESIAN keyword indicates the presence of a Cartesian join. The number of rows (2889) is the product of 27 and 107. In Step 3, the BUFFER SORT operation indicates that the database is copying the data blocks obtained by the scan of emp_name_ix from the SGA to the PGA. This strategy avoids multiple scans of the same blocks in the database buffer cache, which would generate many logical reads and permit resource contention. The ORDERED hint instructs the optimizer to join tables in the order in which they appear in the FROM clause. By forcing a join between two row sources that have no direct connection, the optimizer must perform a Cartesian join. A join type is determined by the type of join condition. An inner join (sometimes called a simple join) is a join that returns only rows that satisfy the join condition. Inner joins are either equijoins or nonequijoins. An equijoin is an inner join whose join condition contains an equality operator. In the preceding query, the join condition is e.department_id=d.department_id. If a row in the employees table has a department ID that matches the value in a row in the departments table, then the database returns the joined result; otherwise, the database does not return a result. A nonequijoin is an inner join whose join condition contains an operator that is not an equality operator. In the preceding example, the condition joining employees and job_history does not contain an equality operator, so it is a nonequijoin. Nonequijoins are relatively rare. An outer join returns all rows that satisfy the join condition and also returns some or all of those rows from one table for which no rows from the other satisfy the join condition. Thus, an outer join extends the result of a simple join. Outer joins require the outer joined table to be the driving table. In the preceding example, employees is the driving table, and departments is the driven-to table. In a standard nested loop, the optimizer chooses the order of tables—which is the driving table and which the driven table—based on the cost. However, in a nested loop outer join, the join condition determines the order of tables. 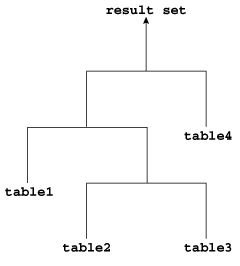 The database uses the outer, row-preserved table to drive to the inner table. It is possible to drive from the outer table to the inner table. The cost determines the order of tables. The outer table, including preserved rows, may be used to build the hash table, or it may be used to probe the hash table. This example shows a typical hash join outer join query, and its execution plan. In this example, all the customers with credit limits greater than 1000 are queried. An outer join is needed so that the query captures customers who have no orders. In this example, the outer join is to a multitable view. The optimizer cannot drive into the view like in a normal join or push the predicates, so it builds the entire row set of the view. When an outer join cannot drive from the outer (preserved) table to the inner (optional) table, it cannot use a hash join or nested loops joins. In this case, it uses the sort merge outer join. A nested loops join is inefficient. A nested loops join can be inefficient because of data volumes. A full outer join is a combination of the left and right outer joins. In addition to the inner join, rows from both tables that have not been returned in the result of the inner join are preserved and extended with nulls. In other words, full outer joins join tables together, yet show rows with no corresponding rows in the joined tables. HASH JOIN FULL OUTER is included in the preceding plan (Step 3), indicating that the query uses the hash full outer join execution method. Typically, when the full outer join condition between two tables is an equijoin, the hash full outer join execution method is possible, and Oracle Database uses it automatically. To instruct the optimizer to consider using the hash full outer join execution method, apply the NATIVE_FULL_OUTER_JOIN hint. To instruct the optimizer not to consider using the hash full outer join execution method, apply the NO_NATIVE_FULL_OUTER_JOIN hint. The NO_NATIVE_FULL_OUTER_JOIN hint instructs the optimizer to exclude the native execution method when joining each specified table. Instead, the full outer join is executed as a union of left outer join and an antijoin. In Oracle Database 12c, multiple tables may exist on the left of an outer-joined table. This enhancement enables Oracle Database to merge a view that contains multiple tables and appears on the left of outer join. Starting in Oracle Database 12c, the preceding query is valid. A semijoin is a join between two data sets that returns a row from the first set when a matching row exists in the subquery data set. The database stops processing the second data set at the first match. Thus, optimization does not duplicate rows from the first data set when multiple rows in the second data set satisfy the subquery criteria. Semijoins and antijoins are considered join types even though the SQL constructs that cause them are subqueries. They are internal algorithms that the optimizer uses to flatten subquery constructs so that they can be resolved in a join-like way. A semijoin avoids returning a huge number of rows when a query only needs to determine whether a match exists. With large data sets, this optimization can result in significant time savings over a nested loops join that must loop through every record returned by the inner query for every row in the outer query. The optimizer can apply the semijoin optimization to nested loops joins, hash joins, and sort merge joins. The statement uses either an IN or EXISTS clause. The statement contains a subquery in the IN or EXISTS clause. The IN or EXISTS clause is not contained inside an OR branch. In the preceding pseudocode, ds1 is the first data set, and ds2_subquery is the subquery data set. The code obtains the first row from the first data set, and then loops through the subquery data set looking for a match. The code exits the inner loop as soon as it finds a match, and then begins processing the next row in the first data set. If the first entry in the departments table is department 30, then the database performs a range scan of the index until it finds the first 30 entry, at which point it stops reading the index and returns the matching row from departments. If the next row in the outer loop is department 20, then the database scans the index for a 20 entry, and not finding any matches, performs the next iteration of the outer loop. The database proceeds in this way until all matching rows are returned. The plan is identical to the plan in Example 9-13. An antijoin is a join between two data sets that returns a row from the first set when a matching row does not exist in the subquery data set. Like a semijoin, an antijoin stops processing the subquery data set when the first match is found. Unlike a semijoin, the antijoin only returns a row when no match is found. An antijoin avoids unnecessary processing when a query only needs to return a row when a match does not exist. With large data sets, this optimization can result in significant time savings over a nested loops join that must loop through every record returned by the inner query for every row in the outer query. The optimizer can apply the antijoin optimization to nested loops joins, hash joins, and sort merge joins. The statement uses either the NOT IN or NOT EXISTS clause. The statement has a subquery in the NOT IN or NOT EXISTS clause. The NOT IN or NOT EXISTS clause is not contained inside an OR branch. In the preceding pseudocode, ds1 is the first data set, and ds2 is the second data set. The code obtains the first row from the first data set, and then loops through the second data set looking for a match. The code exits the inner loop as soon as it finds a match, and begins processing the next row in the first data set. If the first record in the departments table is department 30, then the database performs a range scan of the index until it finds the first 30 entry, at which point it stops reading the index and returns the matching row from departments. If the next row in the outer loop is department 20, then the database scans the index for a 20 entry, and not finding any matches, performs the next iteration of the outer loop. The database proceeds in this way until all matching rows are returned. Apply an NVL function to the columns returned by the subquery. Add an IS NOT NULL predicate to the subquery. In contrast to NOT IN, the NOT EXISTS clause only considers predicates that return the existence of a match, and ignores any row that does not match or could not be determined because of nulls. If at least one row in the subquery matches the row from the outer query, then NOT EXISTS returns false. If no tuples match, then NOT EXISTS returns true. The presence of nulls in the subquery does not affect the search for matching records. In releases earlier than Oracle Database 11g, the optimizer could not use an antijoin optimization when nulls could be returned by a subquery. However, starting in Oracle Database 11g, the ANTI NA (and ANTI SNA) optimizations described in the following sections enable the optimizer to use an antijoin even when nulls are possible. The preceding query returns no rows even though several departments contain no employees. This result, which was not intended by the user, occurs because the employees.department_id column is nullable. The ANTI SNA stands for "single null-aware antijoin." ANTI NA stands for "null-aware antijoin." The null-aware operation enables the optimizer to use the semijoin optimization even on a nullable column. In releases earlier than Oracle Database 11g, the database could not perform antijoins on NOT IN queries when nulls were possible. The preceding query avoids the null problem for NOT IN clauses. Thus, even though employees.department_id column is nullable, the statement returns the desired result. Oracle Database can optimize certain types of joins. A Bloom filter, named after its creator Burton Bloom, is a low-memory data structure that tests membership in a set. A Bloom filter correctly indicates when an element is not in a set, but can incorrectly indicate when an element is in a set. Thus, false negatives are impossible but false positives are possible. A Bloom filter tests one set of values to determine whether they are members another set, for example, set (10,20,30,40) and set (10,30,60,70). The filter determines that 60 and 70 are guaranteed not to be members of the first set, and that 10 and 30 are probably members. Bloom filters are especially useful when the amount of memory needed to store the filter is small relative to the amount of data in the data set, and when most data is expected to fail the membership test. 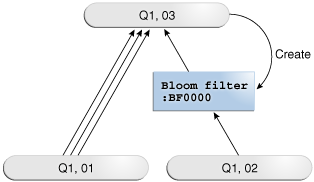 Bloom filters can occur in both parallel and serial processing. Testing the membership of 17 in the set reverses the process. To test whether the set excludes the value 17, element 3 or element 5 must contain a 0. If a 0 is present in either element, then the set cannot contain 17. No false negatives are possible. The optimizer automatically determines whether to use Bloom filters. To override optimizer decisions, use the hints PX_JOIN_FILTER and NO_PX_JOIN_FILTER. This view shows the number of rows filtered out (FILTERED column) and tested (PROBED column) by an active Bloom filter. This view displays the number of rows processed through each parallel execution server at each stage of the execution tree. You can use it to monitor how much Bloom filters have reduced data transfer among parallel processes. In the Predicate Information section of the plan, filters that contain functions beginning with the string SYS_OP_BLOOM_FILTER indicate use of a Bloom filter. In this example, a parallel query joins the sales fact table to the products and times dimension tables, and filters on fiscal week 18. A single server process scans the times table (Step 13), and then uses a hybrid hash distribution method to send the rows to the parallel execution servers (Step 12). The processes in set Q1,03 create a bloom filter (Step 9). The processes in set Q1,02 scan sales in parallel (Step 18), and then use the Bloom filter to discard rows from sales (Step 16) before sending them on to set Q1,03 using hybrid hash distribution (Step 15). The processes in set Q1,03 hash join the times rows to the filtered sales rows (Step 8). The processes in set Q1,01 scan products (Step 7), and then send the rows to Q1,03 (Step 5). Finally, the processes in Q1,03 join the products rows to the rows generated by the previous hash join (Step 3). The following figure illustrates the basic process. Description of "Figure 9-7 Bloom Filter"
A partition-wise join is an optimization that divides a large join of two tables, one of which must be partitioned on the join key, into several smaller joins. Both tables must be equipartitioned on their join keys, or use reference partitioning (that is, be related by referential constraints). The database divides a large join into smaller joins between two partitions from the two joined tables. Only one table is partitioned on the join key. The other table may or may not be partitioned. 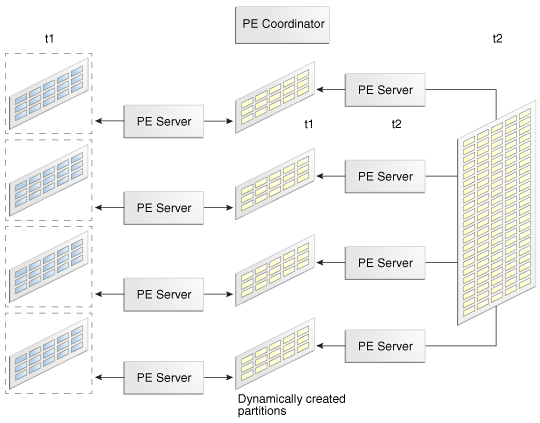 Partition-wise joins reduce query response time by minimizing the amount of data exchanged among parallel execution servers when joins execute in parallel. This technique significantly reduces response time and improves the use of CPU and memory. In Oracle Real Application Clusters (Oracle RAC) environments, partition-wise joins also avoid or at least limit the data traffic over the interconnect, which is the key to achieving good scalability for massive join operations. When the database serially joins two partitioned tables without using a partition-wise join, a single server process performs the join. 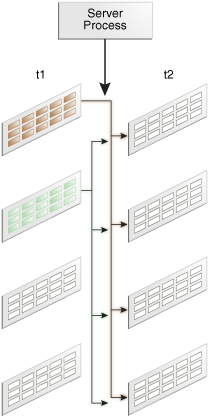 In the following illustration, the join is not partition-wise because the server process joins every partition of table t1 to every partition of table t2. Description of "Figure 9-8 Join That Is Not Partition-Wise"
The database performs a full partition-wise join either serially or in parallel. The following graphic shows a full partition-wise join performed in parallel. In this case, the granule of parallelism is a partition. 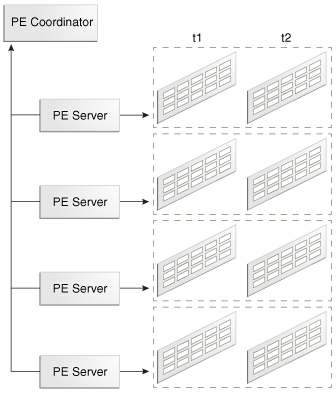 Each parallel execution server joins the partitions in pairs. For example, the first parallel execution server joins the first partition of t1 to the first partition of t2. The parallel execution coordinator then assembles the result. Description of "Figure 9-9 Full Partition-Wise Join in Parallel"
A full partition-wise join can also join partitions to subpartitions, which is useful when the tables use different partitioning methods. For example, customers is partitioned by hash, but sales is partitioned by range. If you subpartition sales by hash, then the database can perform a full partition-wise join between the hash partitions of the customers and the hash subpartitions of sales. Partial partition-wise joins, unlike their full partition-wise counterpart, must execute in parallel. The following graphic shows a partial partition-wise join between t1, which is partitioned, and t2, which is not partitioned. Description of "Figure 9-10 Partial Partition-Wise Join"
Because t2 is not partitioned, a set of parallel execution servers must generate partitions from t2 as needed. A different set of parallel execution servers then joins the t1 partitions to the dynamically generated partitions. The parallel execution coordinator assembles the result.